Notes: 1 stereograph; 20 x 16 cm. Notes: Exhibit titles: Catholic Total Abstinence Fountain, Exhibit #n/a - Herman Kirn; Machinery Hall - Henry Pettit & Joseph M. Wilson; Main Exhibition Building - Henry Pettit & Joseph M. Wilson. Notes: Overview of exhibition grounds with buildings and fountains visible. 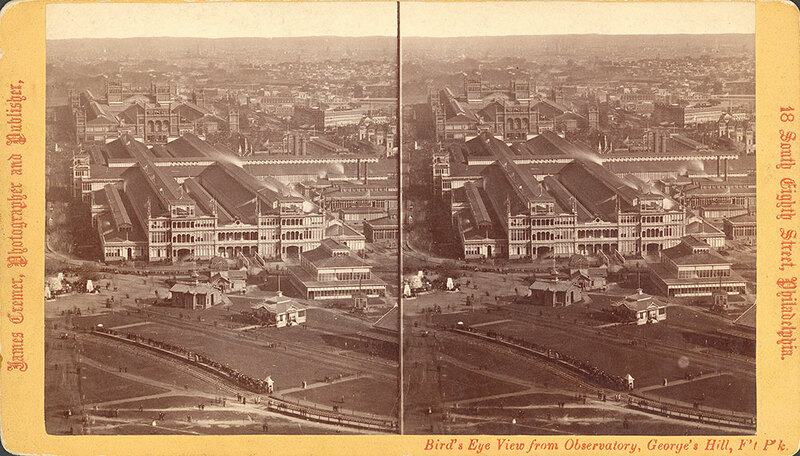 Notes: Title on label: Bird's eye view from observatory, George's Hill, F't P'k.